One of Red Sky Shelters unique offerings is our silicone-coated Legacy roof material. It all started well over a decade ago when we discovered the high environmental impact that PVC-coated materials carried (see our roof fabric page). However, almost all of the suitable outdoor materials were PVC-coated. When we researched silicone rubber we found that it had several promising qualities like extreme weather resistance, low environmental impact and flame resistance. 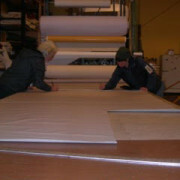 We were mystified as to why it wasn’t being applied to a strong polyester base fabric to yield an environmentally responsible architecturally suitable membrane material. Besides silicone’s high cost it turns out that one of the possible ironic reasons was that silicone’s resistance to fire made it difficult to pass a flame-resistance test. We found out that most synthetic fabrics pass such a test because the heat from the flame causes the material to curl and shrink away from the fire keeping it from catching the flame. On the other hand, when silicone is applied, the rubber holds the fabric in the flame allowing it to eventually catch. It is kind of like school: often grades don’t reflect what one knows, they are rather a measure of how well one can pass the tests. Even though we are not at all chemists, we set up a makeshift lab and spent years and countless hours experimenting with ways to allow silicone-coated material to pass a flame test using environmentally responsible alternatives to the common flame resistance strategies (which didn’t work well with silicone anyway). Eventually we were successful and it was a flagship day when we were able to pass the flame-resistance test. The result is our Legacy silicone-coated roof material that we feel is an amazing roof material. The number of windows and the way you arrange them in your custom Yome is up to you. There are many options for how to use your windows after you erect your Yome as well, and you can change the way your Yome functions and feels in seconds. Here are some considerations and techniques. Yomes are wonderful structures for personal use, but they can also be used to increase your and your families cash flow. Air BnB has made it trivial to post your available living spaces to the internet and begin accepting lodgers. You can do this with a spare bedroom at your house, or you can provide a private setting with some character for you guests with one of our Yomes. What you’ll need: A piece of property, a deck, and a Yome. If you don’t have property of your own, setting up a Yome has minimal impact on the land where it is set up, and you could possibly find a land owner who would be willing to let you set one up. A bonus feature of the Yome is that it is typically considered a temporary structure and doesn’t usually require a building permit to set up. Check with your local building codes to be sure this is the case for your area. We provide deck plans that can be easily disassembled for convenient storage and mobility. The typical working life of a Yome is about ten years. Depending on what specific model you use, and the demand in your area you could have your initial cost repaid in as little as 3-4 months, which would allow for a pretty sizable profit over the course of your Yome’s lifetime. When listing with Air BnB, please remember to look into the local occupancy taxes in your area to prevent surprise tax burdens. The cutting table here at Red Sky Shelters is quite the fixture. It’s about 6ft wide and 20ft long. Because most of the pieces required to make a Yome are fairly large, and because the table is so wide, it’s generally most practical to cut things out as a team, one person on one side of the table and one on the other. This makes for a great opportunity to have a chat, seeing as most of the other things that we do here in the sewing studio involve sitting in front of a machine that makes a little bit too much noise to easily talk over. So, there are some great conversations that happen at this table. Recently, I had the opportunity to do some cutting with Peter, our fair leader, and I got a little history of the Red Sky workshop. The space that we are in here has two huge rooms, one for the sewing operation, and one for the wood and metal-working operation. This is fortunate, as sawdust and metal shards interfere with our ability to keep our projects (your living spaces!) clean. Peter was telling me about his last shop here in Asheville, where they had, for a while, only one space for both of these aspects of Yome creation. All of the woodworking tools would be dragged out into the alley to be used, making it very weather dependent and a bit cumbersome. It also brought them into contact with the auto mechanics who also worked out of the building (who were not huge fans of the hippies in the alley). This is my third installment regarding my experiences with insulating my Yome over the last five years. I like adjusting my environment. Maybe that’s why I’m drawn to live in a Yome. I can change the way my Home interacts with the Larger World in a matter of minutes. Hey, folks. 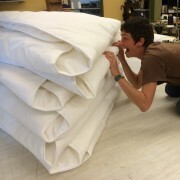 This is Jeremy with a continuing conversation about Yome insulation options. You can find my comments on the roof insulation that we offer in a previous blog. Bottom line, insulating the roof is the most effective step in improving heating efficiency in a Yome. When I first into a Yome I thought it was a very temporary thing for me, but, as I look back over the past four years, I realize I’ve spent almost three of those years living in Yomes! Over those years, I can remember many peaceful mornings. The first thing I heard before my eyes opened were the many bird songs, the little wren who lived in my door frame, the pheobe, the junco, the cardinal. Then there was the creek running down the hill beside the Yome, trickling in the summer, and roaring and rushing after a big, spring rain. One thing about a Yome is they will keep you warm and cozy, however, they really expose you to the surrounding sounds. You feel like you are a part of the surrounding environment. When my eyes would open the first thing I would see was this glorious wide open cathedral of diffuse sunlight! The ceiling in my Yome would fill me with a feeling of expansive thought, room to breathe, and sunshiny coziness. When I lived in the Yome mornings were my favorite part of the day. Now I am living in a conventional house…and every morning I miss that feeling of waking up so near to outside, yet still cozy and snug in my bed. One of the repeated comments that comes up while designing various aspects of our Yomes is, “why only triangles.” It’s a basic concept in carpentry and engineering that we take seriously. Have you ever seen a table or a chair with four legs that might have been a little wobbly? Chances are the difference between this table and a more stable one is the number of triangles incorporated into the design. To see the stability of a triangle versus any other polygon, take four pencils and four rubber bands, and form a square. You’ll notice that if you push on any two sides that the square will deform its shape. Get rid of one of the pencils and one rubber band, and form a triangle instead. Now even though all the points where the pencils connect are just as flexible, the shape doesn’t change. This is the inherent stability of triangles, and it’s what we seek when trying to create a stable structure. 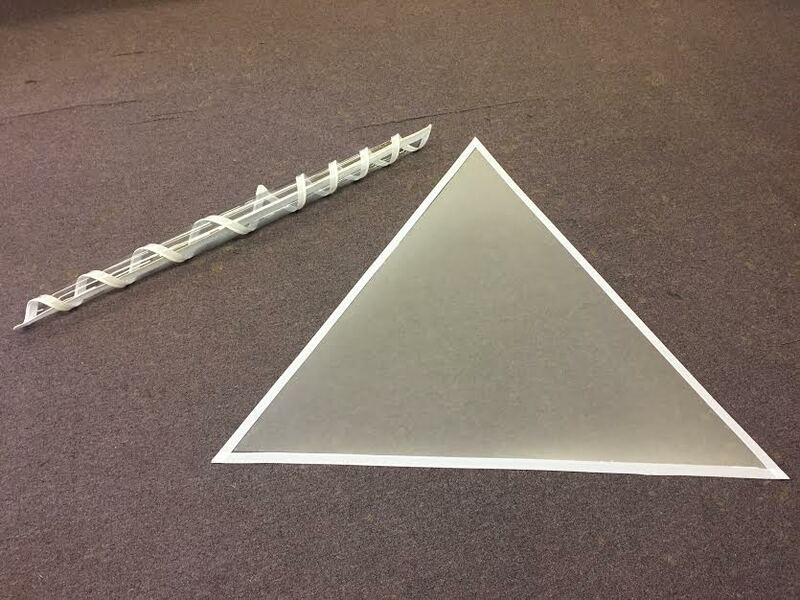 If you look at our Yome designs you’ll notice one predominant feature, their frames are made entirely of triangles. This is important since like our previous pencil models, the vertices of the Yomes are able to pivot around the bolts that hold them together. By using triangles, we are able to make sturdy structures with much less material saving you money, keeping our landfills free of waste, and allowing the Yomes to be much more portable than they would be otherwise. Next time you sit down at your table, or on that nice sturdy chair next to it, have a look underneath and see if you can spot the triangles that hold it all together. And next time you go into your Yome, have a look at the framework knowing that you’re surrounded by a structure designed to remain stable and strong with a minimal use of materials. Today is roof assembly day, and I, Jen, will be wrestling with some serious silicone-coated goodness. 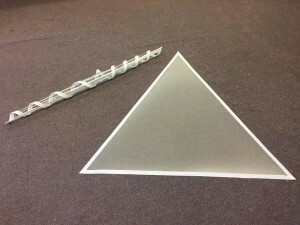 Last week I put together some panels, attaching two triangular pieces to form a bigger triangle, then putting the flaps that enable connection to the structure and the sidewalls. And now I’m ready to put it all together into the behemoth that will keep someone dry and cozy. Something that always strikes me when working on something this size is the balance of simply wrestling these big pieces (they are around 9 ft long) under the machine while holding them precisely beside one another with the right amount of tension on the top and bottom pieces to be sure that they match up exactly, and that the seam is the right width the whole way. Kind of a micro and macro vision at the same time. So I start with just two pieces, lining them up under the needle and stitching them together. Then I run the same seam through the machine again, this time adding a piece of webbing (that is kindly folded for me by a lovely device attached to the machine) that will keep the seam from stretching too much. Then I add another section onto these two. And then another. And pretty soon this thing weighs around 50 lbs. I am still making sure that I maintain the micro-balance of the seam allowance and moving the rod through the machine smoothly. After all the sections are attached to one another, I now have a cone-shaped monstrosity that I climb onto the table to shake into submission for the final step: adding the big grommets that will slide over some bolts that hold it onto the frame. This entails first adding a piece of webbing onto the corner, then popping a hole in it with a size-specific cutter, then putting the grommet through that hole, pounding it liberally with a hammer, and voila! Corner grommet. Each of the seven corners gets this treatment (today’s roof is for a SeptaYome) and then I can get up on the table again, and have one final wrestling match that ends in a loosely bundled roof that is ready for final folding and seam sealing. And I’m off to my home for some supper!